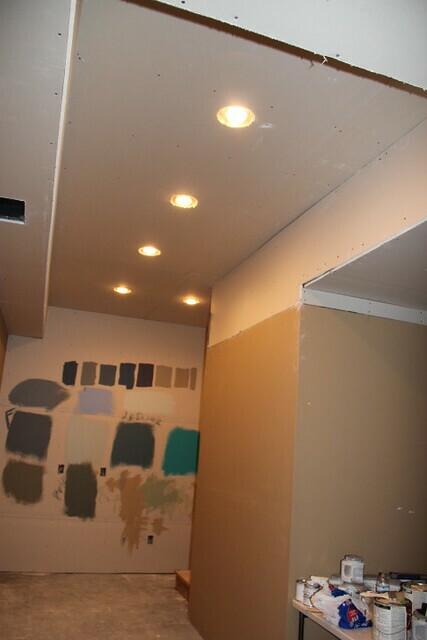 The basement remodel is getting SO close to being completed that I can smell it. Sheetrock dust and cans of paint samples are everywhere down there. Andplusalso we decided to rip up the carpet on the stairs so sheetrock dust is now creeping upstairs into the living room via our feet. 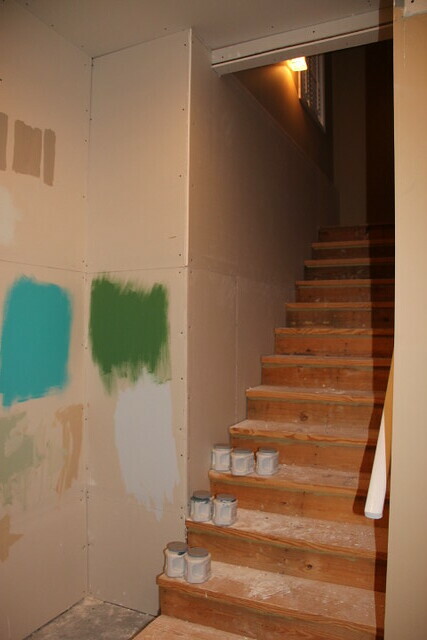 Here is the corner wall at the bottom of the stairs where the cabinets will be going. 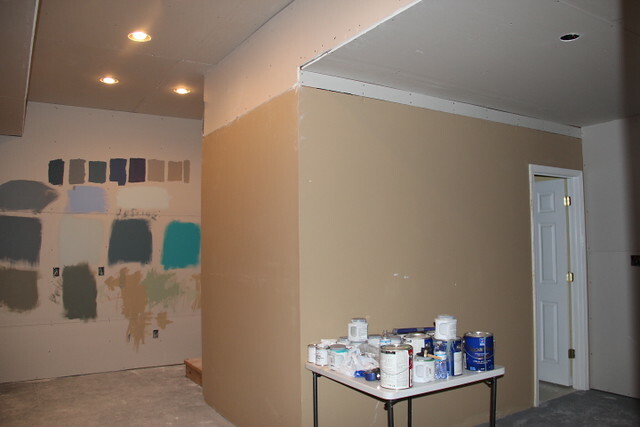 Sheetrock, glorious sheetrock! And this is the part where you all go, DANG, Beth! 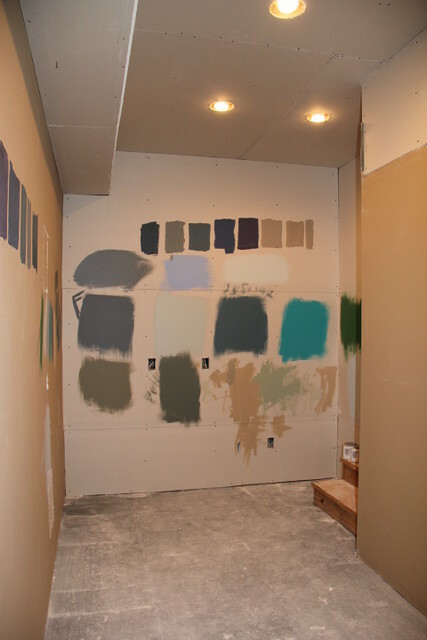 Think you’ve got enough paint samples on that wall? No, no I don’t. Because even with all those samples I still cannot decide what I like. So instead of talking about that I’m gonna tell you what I DO like which is basically EVERYTHING! I especially love seeing all of Garrett’s artwork that he created when we asked him to help us paint samples. My favorite part is the ceiling. We made this area just about as high as our basement ceiling is gonna get. The center area is ten foot high with five can lights added in for extra light in that dark corner. I wanted the ceiling as high as possible down there so this was what we came up with. 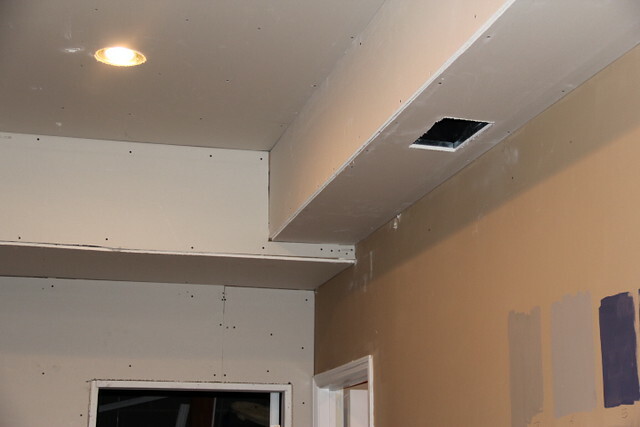 J and his dad boxed in a firred down area around the ductwork to create a tray ceiling effect. The plan is to do some double crown molding. I think this might accentuate the ceiling line where it drops down to eight and a half feet, but I’m very happy with this raised ceiling effect. It really helps open that narrow area up. 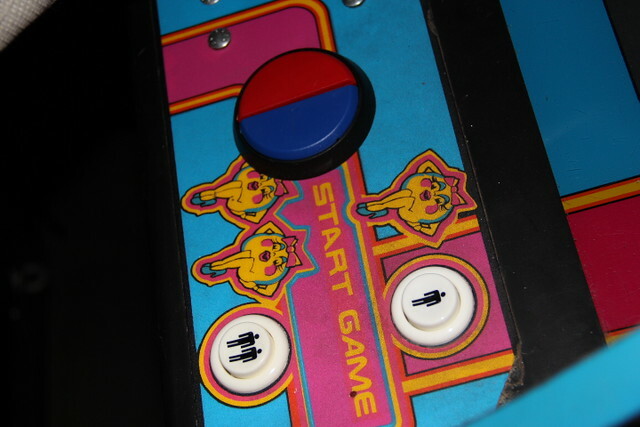 This is the nook that we are calling the arcade room. Light fixture not yet hooked up. 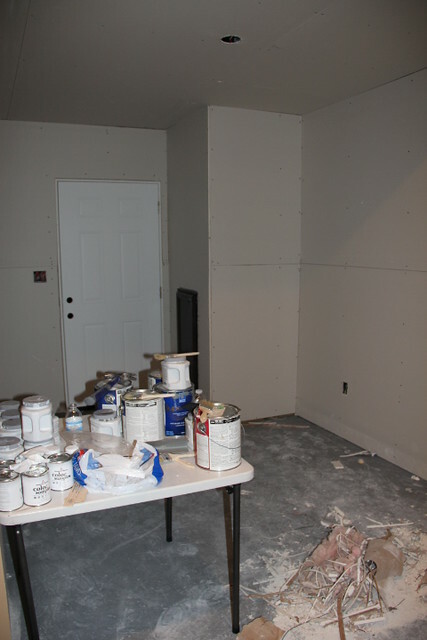 Here is the view from the back of the arcade wall toward the theater room. 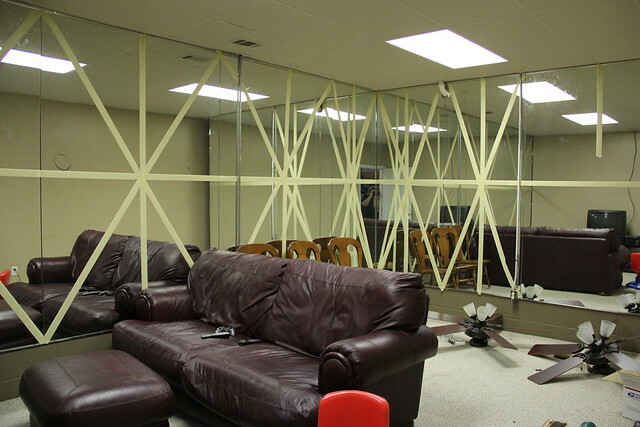 In case you forgot and want to be horrified, here is what it looked like before. 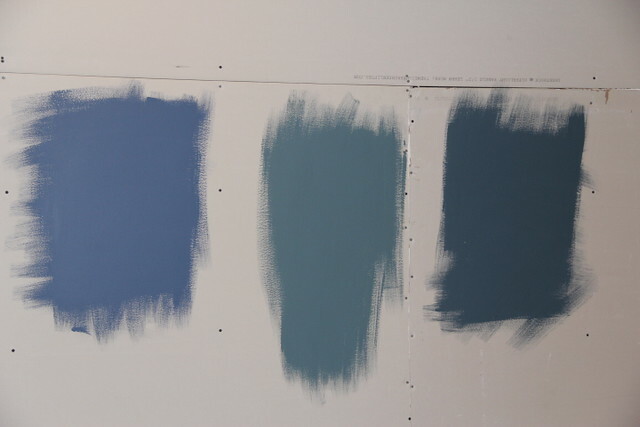 Here are the top three paint contenders for the room. From left to right, SW Denim, BM Spellbound and BM Brittania Blue. 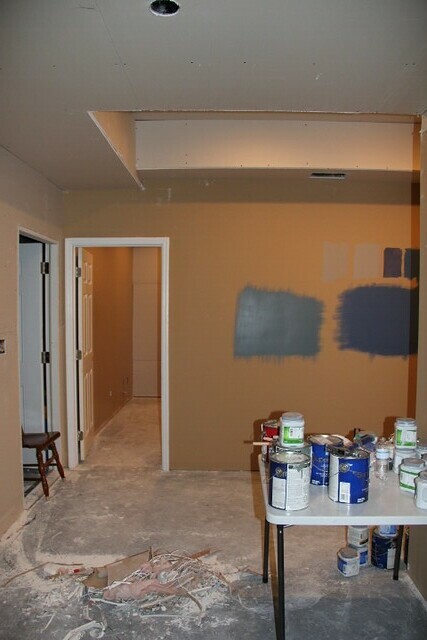 If you’ve been around this old blog very long you’ll know that I absolutely despise picking paint colors. 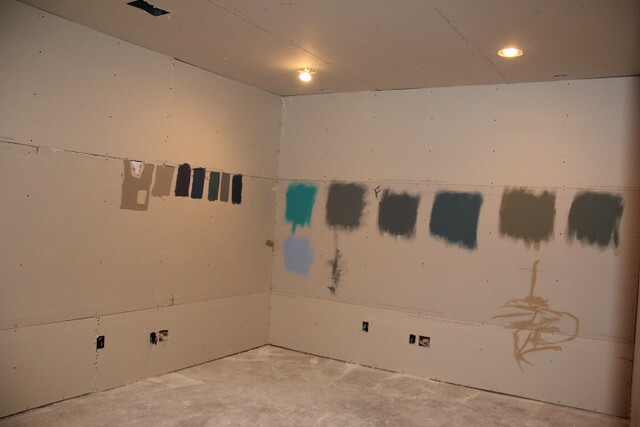 I can’t make a good solid paint picking decision on the first try to save my life. This project is no different. I’m right back in paint picking hell this week. Blurg. If anyone has an opinion please feel free to share it! I’m very excited to see how this is going to shape up in a few days after Francisco and crew get finished with the mud, tape, sanding and paint. I have big plans for the staircase. There have been lots of surprises around here lately. Here’s a sneak peak at what J surprised me with this week. Oh Beth – I’m feeling your pain. 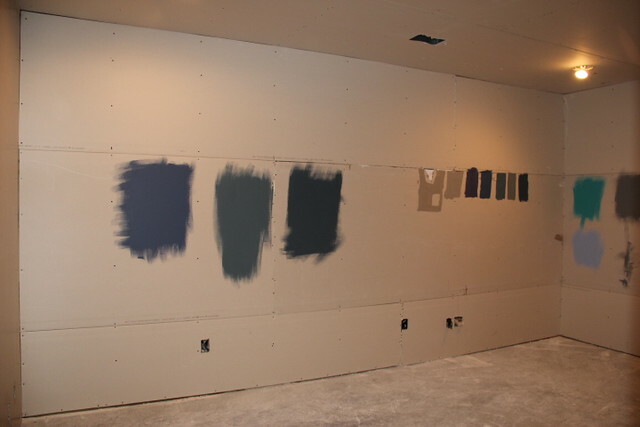 Hubby and I have 5 paint colors on the wall just to pain a small family room and I can’t make a decision. Makes me crazy! 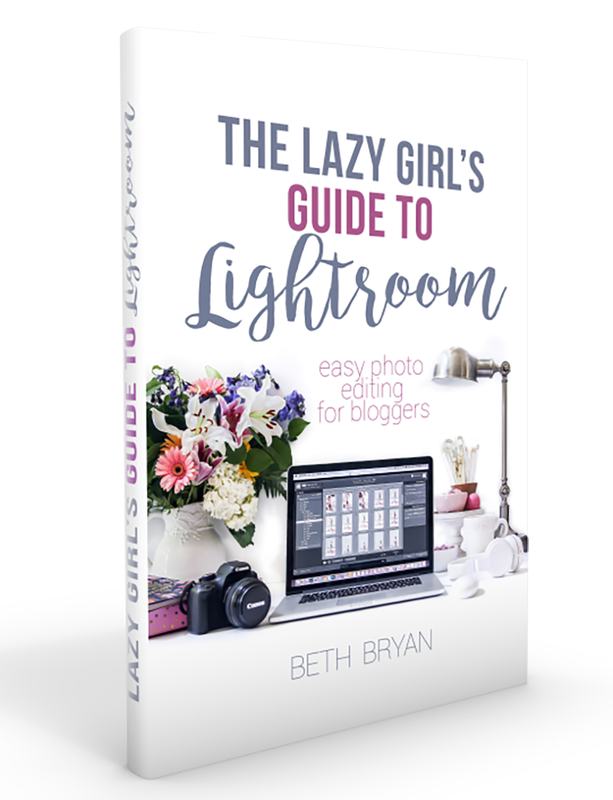 It’s going to look fabulous Beth – whatever colour you choose!